Thank goodness I exercised early today because I got on the computer when I got home and I haven’t gotten up all day. I haven’t showered yet, I haven’t eaten yet. I don’t even remember what day it is. This darn computer draws you in and doesn’t let go until you can no longer see the screen. 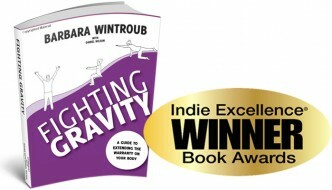 I am writing press releases for my book “Fighting Gravity”. I am branding myself as an active aging expert since I am actively aging sitting here at the computer. Actually, I have a rolling pin under my feet to roll out the tightness from playing Pickleball. I sit on a stability pillow so I am able to rock and roll side to side and front to back as I sit here all day long. If I have to spend long hours on the computer at least I can be somewhat active. I do in fact “live my fitness routine”.